If you’ve got little ones, you’ll understand the important of getting clothing and accessories that take care of both them and the environment. And with a Frugi discount code you can splash out on a wide range of gorgeous organic baby products without breaking the bank. Whether you’re looking for comfy and discreet nursing clothes or the cutest newborn baby grows, a Frugi discount code will save you money while you shop. Frugi started life when new mum and dad Lucy and Kurt had their first baby Tom. They wanted Tom to use cloth nappies, but struggled to find baby clothes that would fit over the top. In a moment of inspiration, they decided to make their own range of baby clothes specifically designed to fit easily over cloth nappies – launching Cut4Cloth from their spare room. Over the years, Cut4Cloth grew from strength to strength, eventually expanding into clothes for kids and mums. In 2008, the company rebranded to Frugi – which means fruits of the earth in Italian – and built a new online store dedicated to selling a wide range of organic clothing and accessories for children aged up to 8 years. Now in their 11th year, they’ve been supplying their quality products to satisfied customers around the world for more than a decade. At Frugi customers can shop for everything they need to welcome their new arrival into the world. Want some adorable unisex outfit for your newborn? You’ll find plenty to choose from including snug baby grows, rompers, t-shirts and more. Or perhaps you’re looking for the perfect dress for your toddler to wear to a summer wedding? Whatever you’re looking for, they’ve got something to suit every budget and style. There’s even a range of gorgeous breastfeeding tops and dresses that let mums look stylish while nursing their babies. At Frugi they love organic cotton, and all of their products are crafted from super soft materials that are kind to your babies skin and won’t irritate any allergies they might have. Ecologically sourced from sustainable sources, it’s a material that’s kind to the environment too. What’s more, all of their clothes are designed with the knowledge that kids love to be kids – so they’re really fun and colourful to wear, and durable enough to withstand the most rough-and-tumble playtimes. And with Frugi’s fast and efficient delivery service, whatever you order will reach your doorstep in record time. Want to get shopping with Frugi? With a Frugi discount code you can enjoy fantastic savings on their wide range of clothing and accessories for babies, kids and mums. So whether you’re shopping for your first baby or picking up some hardy clothes for energetic toddlers, a Frugi discount code will help you save the pennies. Beautifully crafted clothing made from soft organic cotton. Browse our website until you find the Frugi discount code that suits you, then navigate to their website to begin searching. Enter your Frugi discount code in the box provided. Want to find out more about gorgeous baby and kids clothes with Frugi? Why not pay a visit to their dedicated YouTube channel here? You’ll find lots of exclusive content including collection previews, fun features, shopping guides and more. 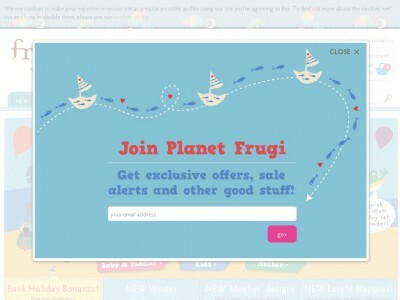 You can also use this channel to find out more about saving money with a Frugi discount code. If you've enjoyed shopping with Frugi, you might also like to check out more great deals on mother and baby products at stores like Mothercare or Babies R Us. Or, if those aren’t right for you, you’ll find plenty more deals to browse in our Babies, Kids and Toys section. Enter your email address and click ‘Continue’. Review your order and click ‘Continue’. Need to contact the team at Frugi? Whether you have a question about your order, want some expert advice on choosing the right products for your baby or just want to find out more about how you could make fantastic savings with a Frugi discount code, you can contact the Customer Services department by telephoning 01326 572828. Want to discover more from Frugi? Why not follow the company across all your favourite social media networks? You’ll find lots of interesting content including parenting articles, competitions, special offers and more. You can also use these pages to find out more about saving money with a Frugi discount code. Don’t forget to check them regularly, as you can never be sure when a free Frugi discount code might be waiting for you! Buy now online at www.welovefrugi.com. When my daughter arrived, we wanted to save money and be kinder to the environment by using cloth nappies. But we really struggled to find clothes that would fit over the bulk! Then I discovered a Frugi discount code online. With a Frugi discount code you can enjoy fantastic savings on a wide range of baby clothing designed to fit over cloth nappies at frugi.com. I used my Frugi discount code to get a great deal on some really cute baby grows – and they’re made of organic cotton too! So why not see what you could save with a Frugi discount code?